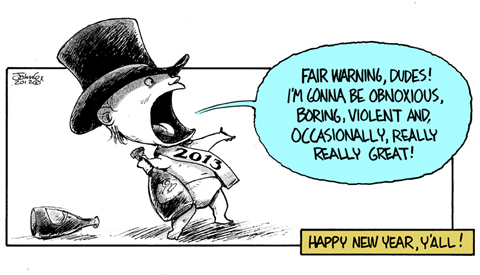 He can't be much more obnoxious, boring, and violent than 2012. Let's hope for the really, really great part. Happy New Year John. Thanks for laughs and insight. Happy New Year to all the others who, like me, need more to do with my time. Happy New Year Everyone! It's going to be a rock-and-roller. Ho, ho, ho, Merry New Year! Happy New Year, John and all who post stuff here. You are amazing. Backatcha! Hope the new year finds you hopeful and energetic. I can't afford a new year. I'll be salvaging as much of 2012 as I can & selling it as scrap. Happy New Year John, and all you fellow travelers. John, may your inkwell never run dry! This page contains a single entry from the blog posted on December 31, 2012 12:40 AM. The previous post in this blog was Character Study: ALIENS.